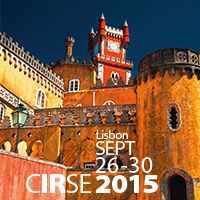 Celebrate 30 years of CIRSE! CIRSE 2015 marks the organisation’s 30th anniversary, and our celebrations will include a one-off event, the X-Session, presented by six former CIRSE presidents, who will recall important formative moments from their clinical careers, and reflect on how the field of IR has grown and progressed since their early involvement. Lisbon offers a great opportunity to celebrate our diverse community and explore our growing specialty, and promises to be a congress to remember. Come celebrate 30 years of excellence in IR with us in Lisbon!